My brother was staying for a week in my sewing room that turns into a guest room with a nice queen size air bed. I warned him that my dryer was out of commission and to do laundry he’d need to take it to a laundromat a couple miles up the street or to another brother’s house nearby. Instead, one day there were damp clothes hanging all around the balcony: doorknob, hook, light fixture, bike handlebars, plant shelves, even the tire pump leaning against the wall. “You could say that my damp clothes wiped it off for me,” he said. A clothesline out there could be useful in the summer, when 115 degree heat and 7% humidity would dry items quickly. Maybe some hooks or rings screwed into the walls and corner column would provide anchor points for removable or temporary lines. Add it to my someday projects list. April 4, 2015. 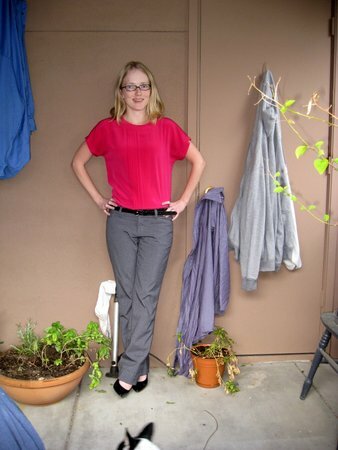 Tags: clothes, Goodwill, Target, What I Wore to Work Today. Pictures, What I Wore to Work Today, Words.